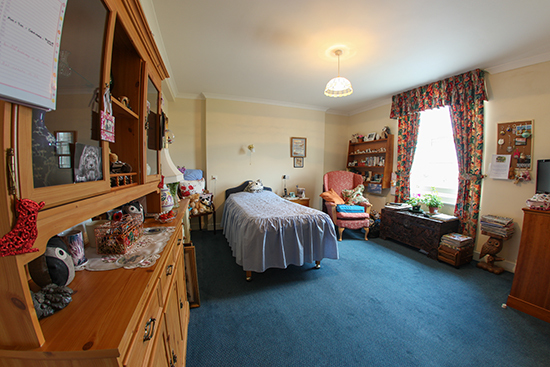 Looking For Private Dementia Care For Your Loved One In The Herne Bay? Choosing a care home for your loved one, especially when they have dementia, can be a tricky business. The best way to assess if a home is right for your loved one is to visit and get a feel for the atmosphere, see how well the residents are treated, and what the staff are like with them. We'd love you to come and visit St Peter's to see how we measure up. You're very welcome to call in anytime. In the meantime we've listed below answers to some of the questions you may have. If there's anything we've missed please feel free to call us on 01227 744000. Will you be able to cope with my loved one's dementia? St Peter's is not a specialist dementia unit for people who are exhibiting disruptive and aggressive behaviour. If this describes your loved one we recommend you seek specialist help. For most people who are living with dementia this is not the case and St Peter's will be a great choice. 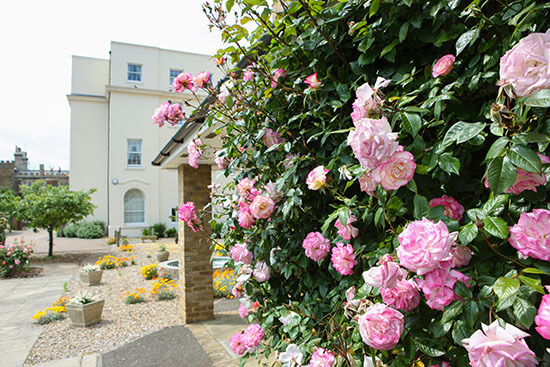 It is primarily a residential care home that has the expertise in dealing with dementia for those residents who develop it as they get older, or those who simply can no longer cope effectively at home. This Nursing Home is faultless! This Nursing Home is faultless! The care is exemplary, the staff are extremely pleasant relaxed and friendly. When I first came to look at St Peter's, the first thing I noticed is how pleasant the home smelt! I then noticed the beautiful drapes, very thick, superbly made. I asked why these curtains were so beautiful and obviously expensive? The reply was - 'we could have bought cheaper ones, but we face the sea, this is the residents home and it should reflect that.' What a lovely way to run a home and yes, even in the bleak midwinter the Home is always very very warm and not draughty. The Home is spotlessly clean, the visitors can make their own tea whenever they want, my Dad's room is overlooking the sea and is en-suite. There is activities for the residents to do nearly every day. I think St Peter's is very, very reasonable for the service they offer. St Peter's Care Home has a 'thumbs up' from me, and Thank You so much for looking after my Dad so fantastically. If you are unsure of whether St Peter's is the right care home to accommodate your loved one's needs please feel free to call the Home Manger on 01227 744000 for a confidential chat. How do I know they will be well looked after? We feel the best people to tell you the sort of care your loved one will receive at St Peter's are those who have experienced it. So, here's what two of our many grateful families have to say about their loved one's stay here. Here's what S. D Had to say about here Fathers care at St Peter's. "My father is a resident in this wonderful home and all his days are happy and fulfilled. He is 97 years old. The dignity and attention to his individual needs and wishes (and that of the family) are always paramount in the care shown. He is kept well by excellent health/infection management. He is kept happy by love, activities and excellent food. It is truly his home in all senses." "From walking in and meeting the management and the staff I am so happy at my mother being cared for here. The care, compassion and dignity given is first class. Their attention to detail is superb, cleanliness is excellent, activities are 7 days a week. The food is excellent and all the staff interact with the families from the moment you enter having such a welcoming effect. My own mother cannot speak but such great care and TLC given to her and including her observing many activities and seeing her now smile at staff say so much to me. I cannot thank them enough." What will their room be like? It's really important that someone who is living with dementia has familiar surroundings so they feel calm and relaxed. We'd love you to bring their own ornaments, treasured mementos and small furniture items to make their room their own. We'll even re-decorate it in line with their home decor to truly make it feel like home if you'd like. All rooms have lovely light and airy feel which contributes to a feeling of calm as does the views across the bay that is a feature of many of them. Who will be looking after them? We believe the staff best team in the region! Conveying the depth of care and expertise provided at a care home is difficult. After all, everyone says they have brilliant care. We truly believe you'll find the care your loved one experiences at St Per's is the very best available. Here are a few things we hope will demonstrate that. Unlike many care homes in the area our staff turnover is very low. This is particularly important if your loved one has dementia. Changes to routine and personnel can make them anxious and confused. Seeing a familiar and trusted face is reassuring and will ensure that your loved one will be comfortable and relaxed, even when dealing with the more sensitive aspects of personal care. 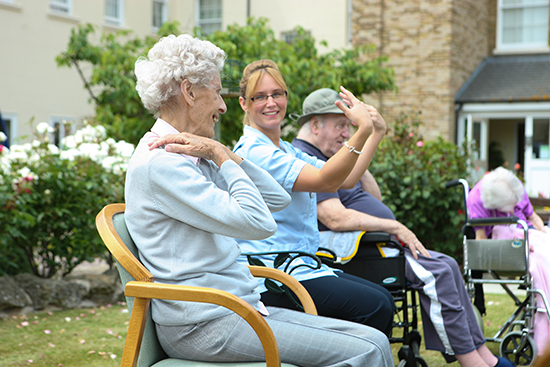 Our staff to resident ratio is much higher than the legal requirement and most other care homes. This means your loved one will get all the personal attention they want and need. In addition our team is strong and stable with the majority of staff members being at St Peter's for many years. This means they can really get to know your loved one and fully understand their needs. Families are frequently amazed by the positive transformation in their loved one when they come to St Peter's, both physically and mentally. But don't just take our word for it. We have an open door policy and you're more than welcome to chat with existing residents and their families for a first hand account of the exceptionally high quality care your loved one will experience at St Peter's. 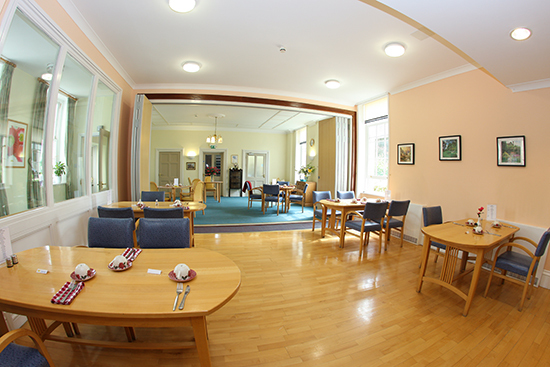 The best way to see if St Peter's is the right home for your loved one is to come and visit. So we'd like to invite you on a personal guided tour to really get to know the home. When you arrive we'll have a quick, confidential chat about your requirements and then take you around the home to show you all the facilities. Afterwards you can ask us about anything we haven't covered, then talk to whomever you please and wander round yourself as much as you like. We want you to be absolutely sure this is the right home for you, so you and your loved one are also more than welcome to join us for a day to meet everyone, get involved and see what life is like first hand. Or you can simply join us for lunch and one of the many entertainment sessions if a whole day is not convenient. To arrange your personal guided tour please call us on 01227 744000 or click here to email us. Or feel free to call in anytime for a look around. The Kettle's always on and we'd love to meet you. P.S. 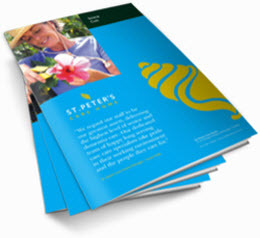 St Peter's is a very popular provider of dementia care in Herne Bay. To avoid disappointment and a wasted journey, please call to make sure a place is available before before embarking on a long trip to visit home.